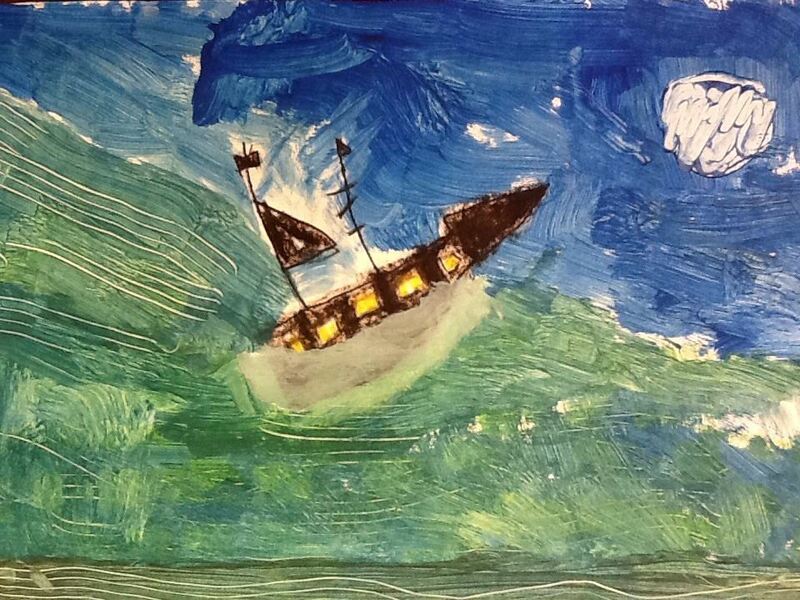 Students used green, blue and white paint to create oceans. They could add texture with a fork or white clouds if they chose to. 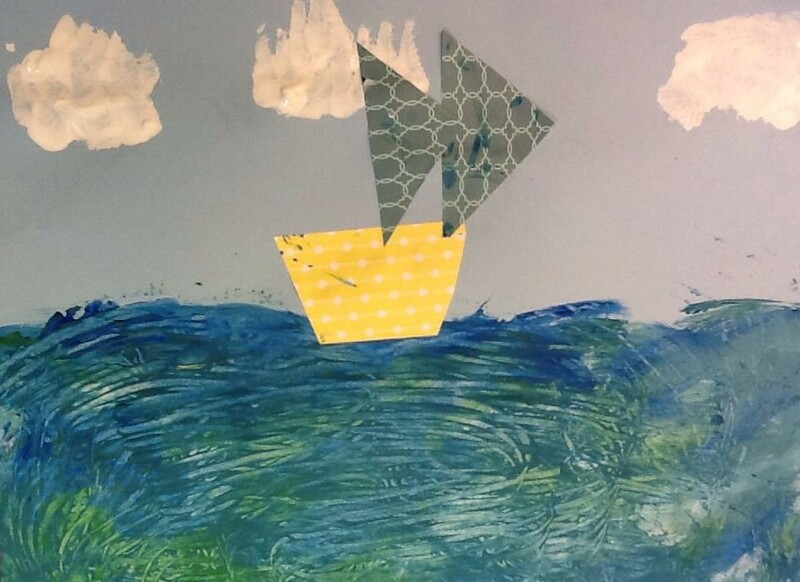 Triangle, rectangle and square shapes were reviewed and students were shown how to cut various sail and boat shapes. 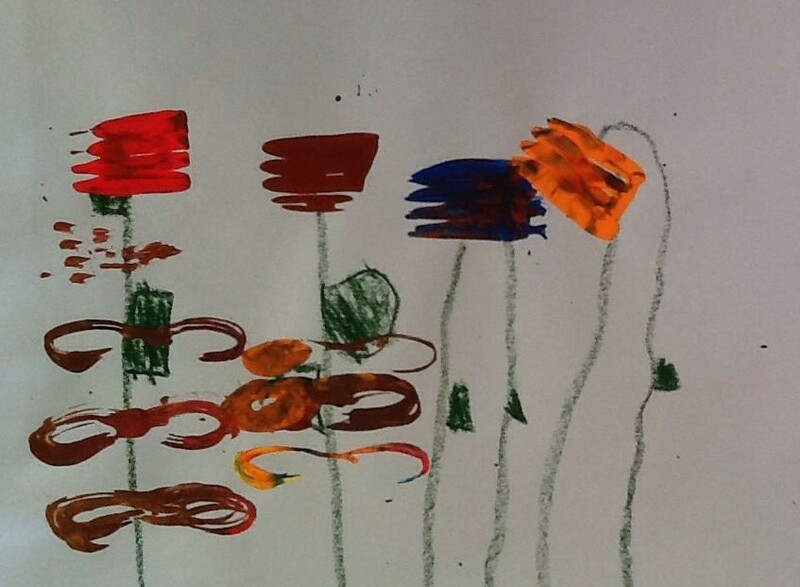 Preschool students used oil pastel to create stems and leaves. 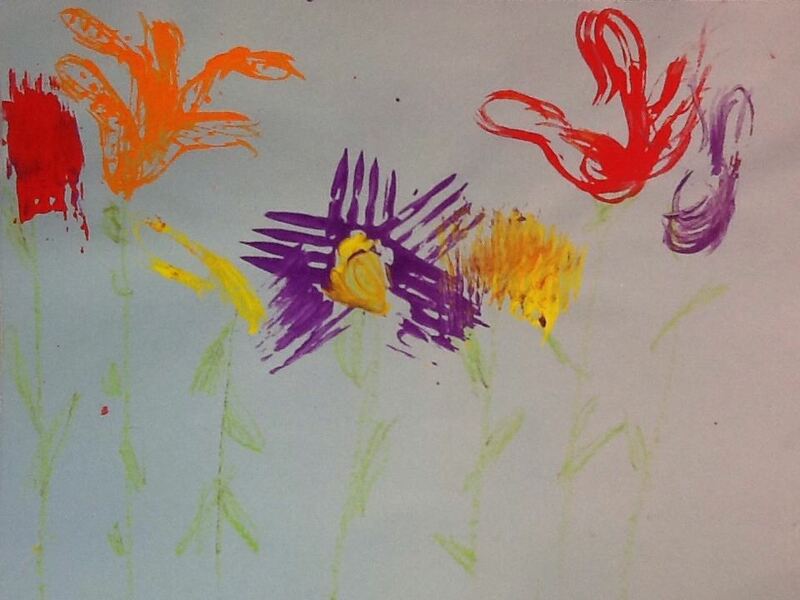 They used objects such as forks and cardboard tubes to print the flowers. 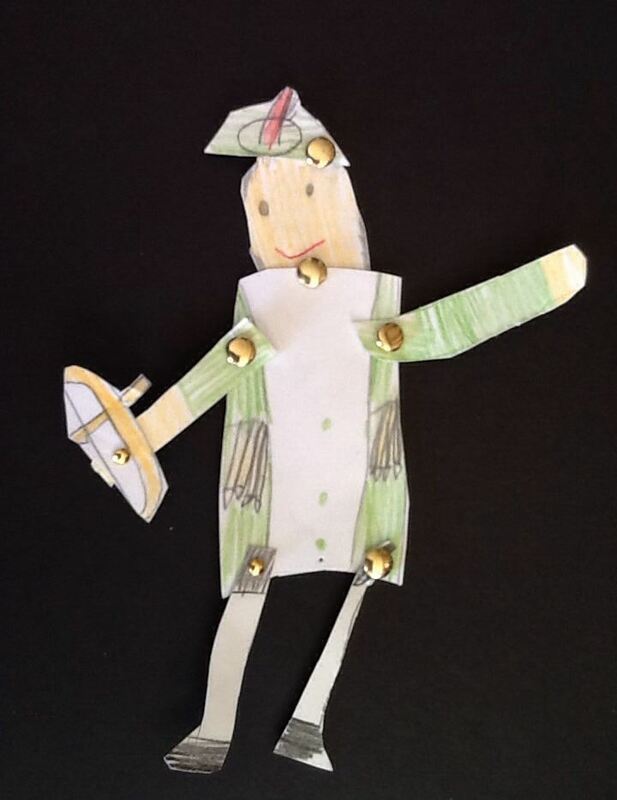 Grade 2 Students created these puppets using card stock and brads. 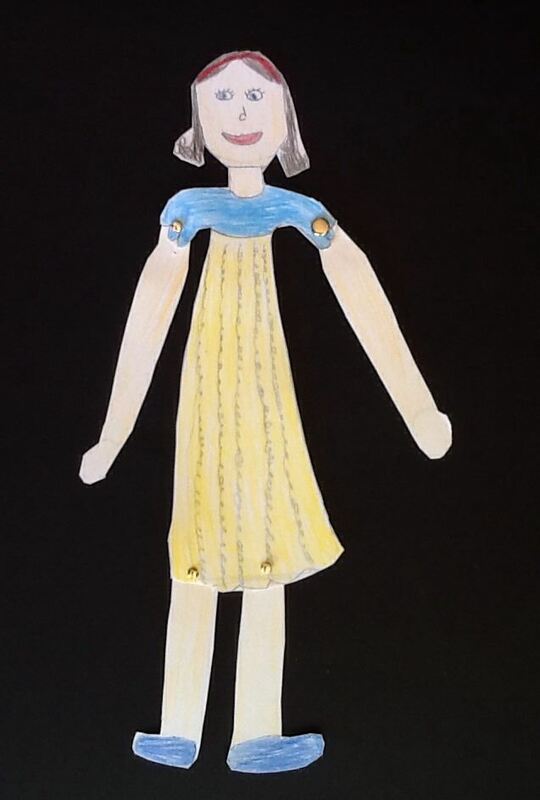 They used characters from books, fables, or fairy tales. I have done this lesson for many years in various formats. 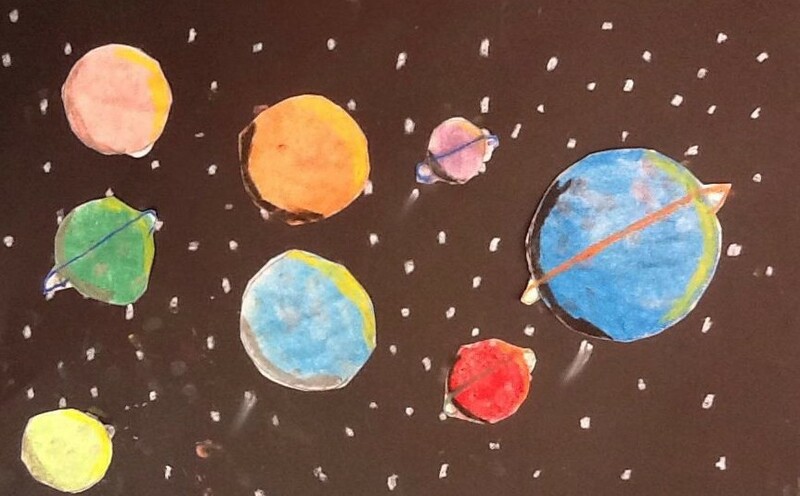 I have always done it with grade three as they study the solar system as one of their science units. 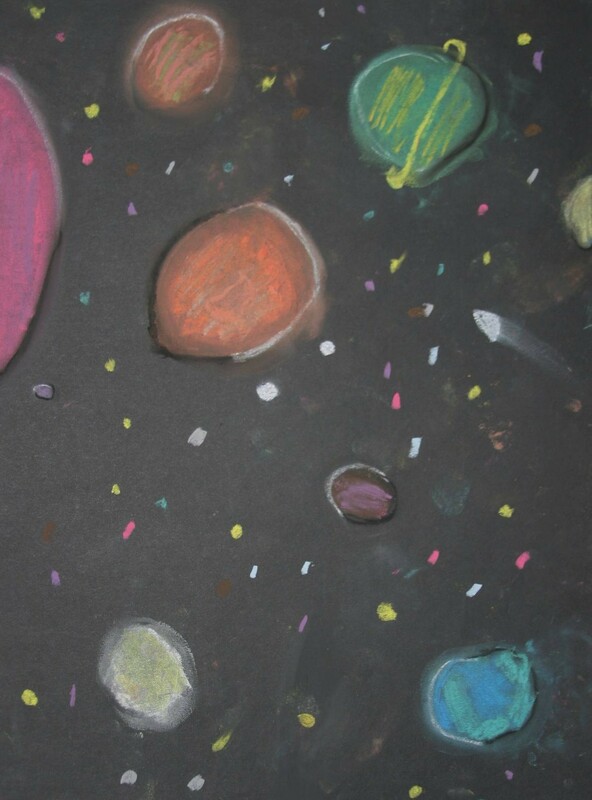 Some years, I have had the students create the planet spheres directly on the black paper. The focus is more on light, shadow, shape and form rather than recreating our plants. I always discuss highlight, shadow and light source and use a flashlight and a sphere so they can see how moving the light source changes the location of the shadow and highlight. 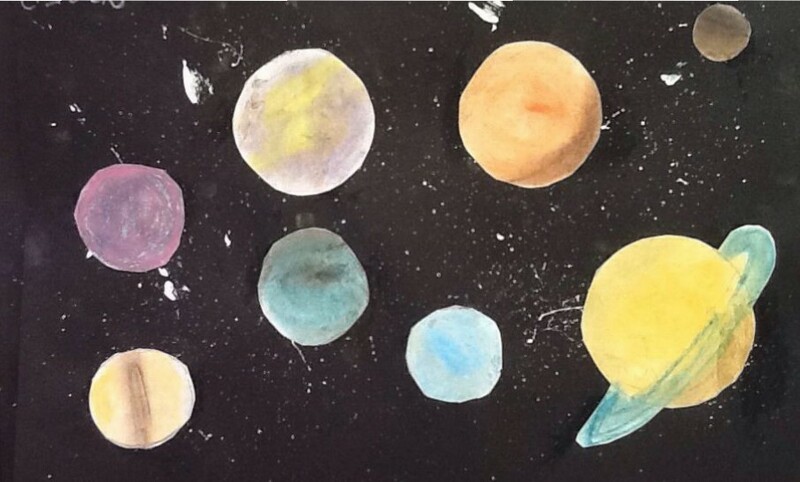 This year, I had them create the spheres on white paper then cut and glue onto a black background. With one class, I tried splatter painting the background which worked fine but was a bit messy. 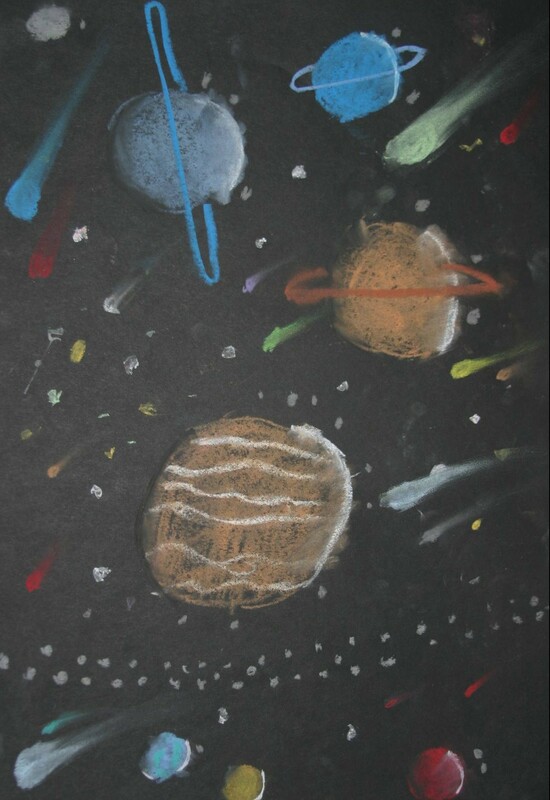 For other classes, we used white oil pastel to create stars and comets. 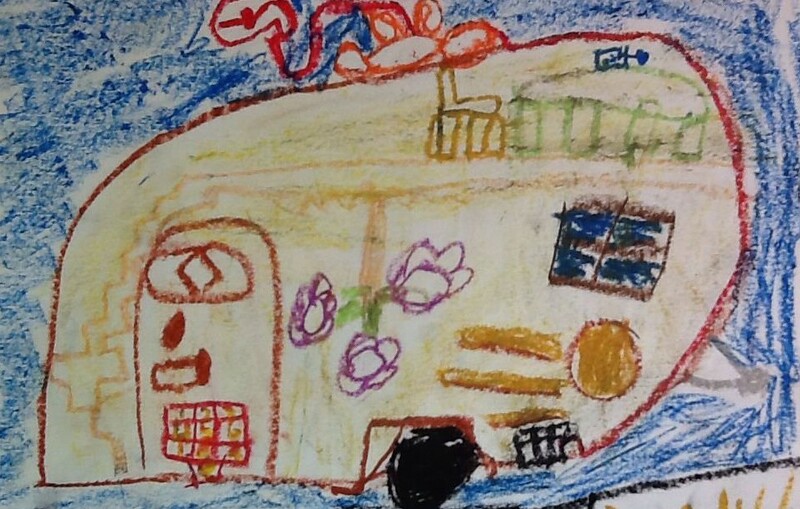 Grade K/1 students looked at images of colorful vintage trailers and talked about what it might be like to go camping in one of them. 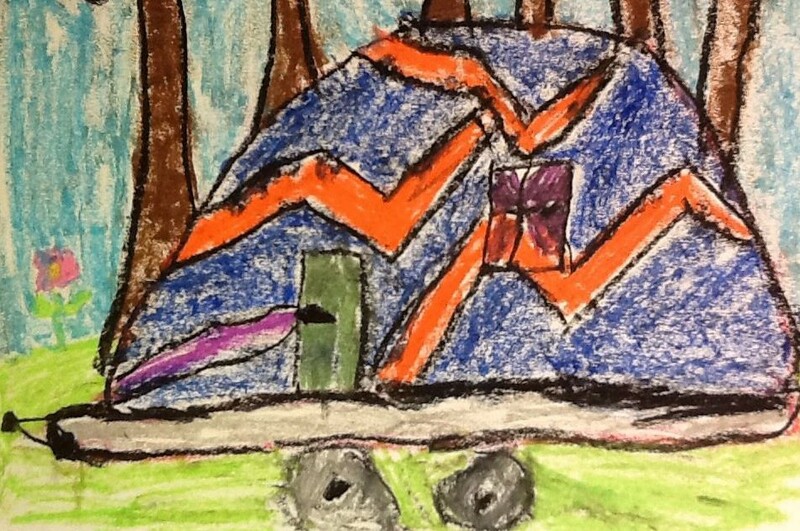 They then created a travel trailer of their own design and put it in a camp setting. Most of the grade one classes study the rain forest when they study an ecosystem. This year, when I asked this class, what they knew about the rain forest, they said they were studying the desert. 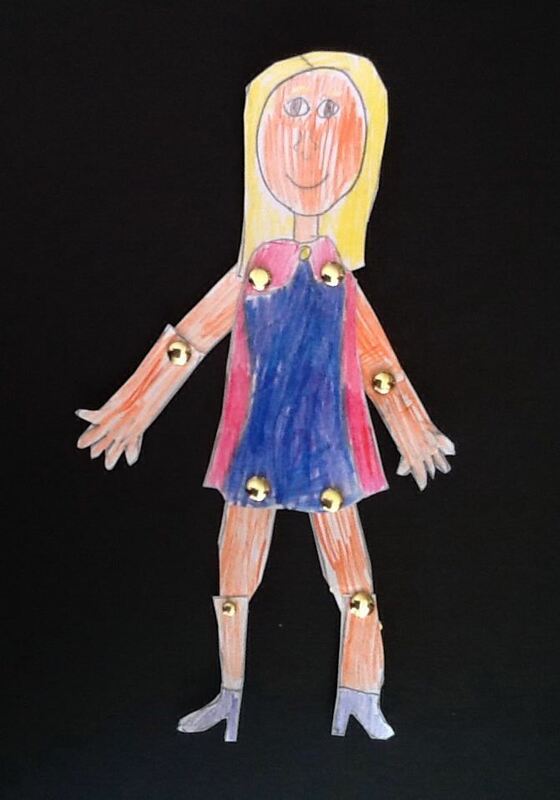 I did a quick change up to this lesson. We pulled up images of the desert to look at. 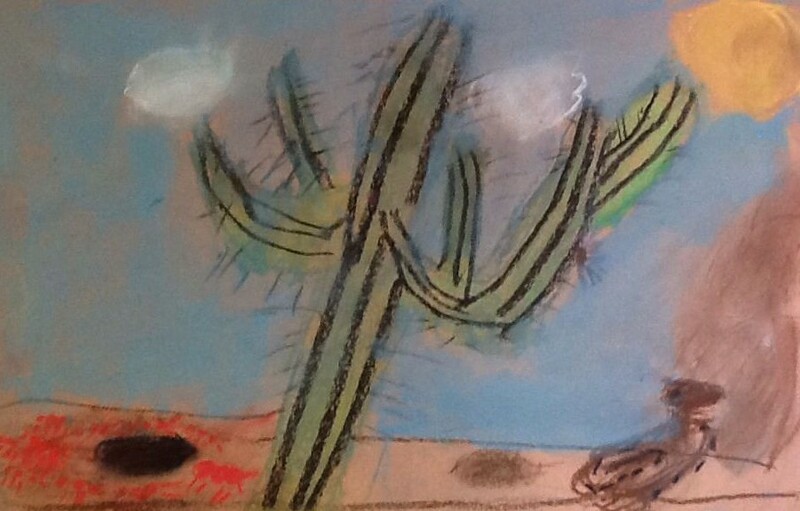 Students used oil pastels for cactus to make it appear waxy and slightly shiny. 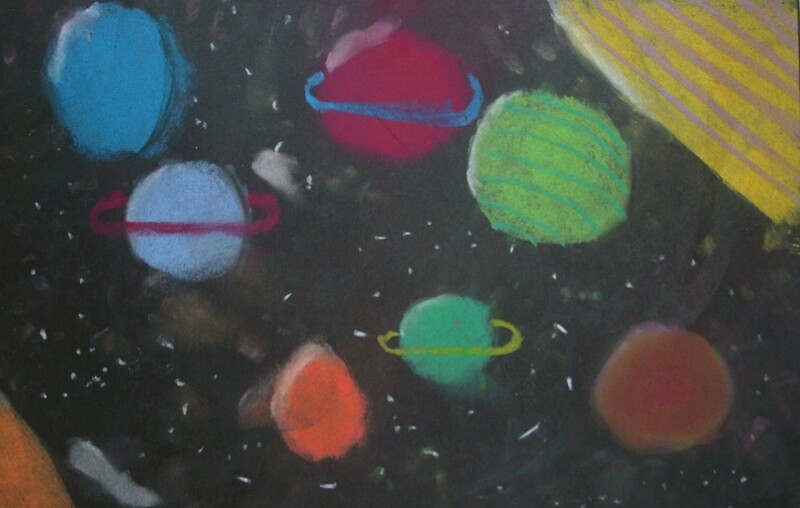 They used chalk pastels for the background to give it a dusty dry feeling. They could add an animal if they chose to in whatever medium they chose. I saw this lesson on the internet somewhere but cannot find it now to reference it. 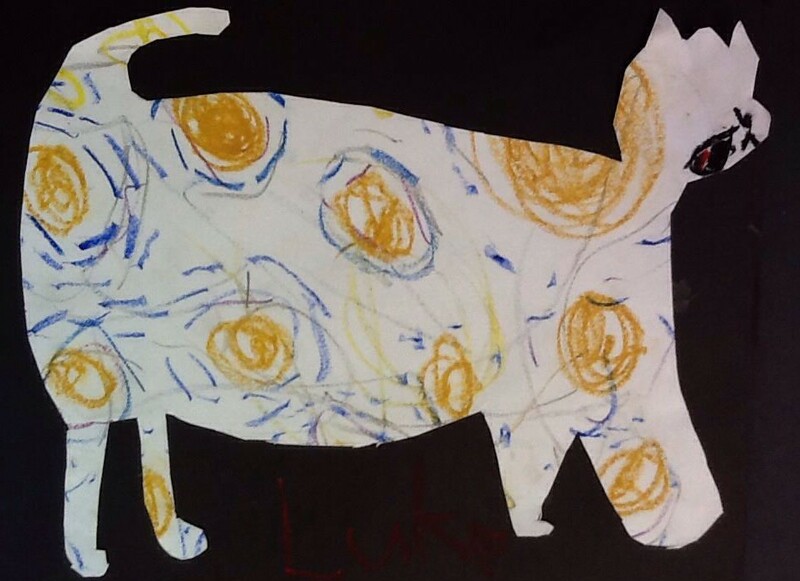 It is based on the book Van Gogh’s cat that was published by Scholastic. 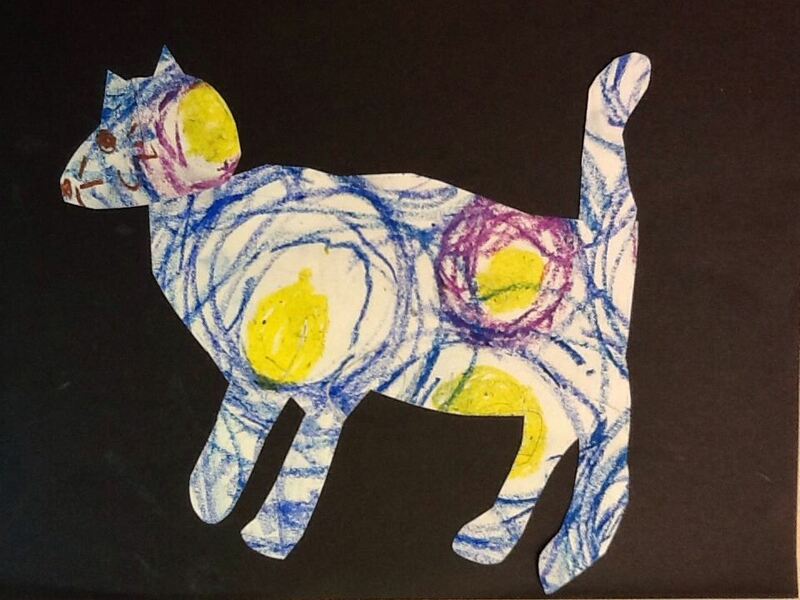 The K/1 classes drew starry night patterns on their paper then flipped it over and drew the outline of a cat. They cut out the cats and glued them onto a solid background. 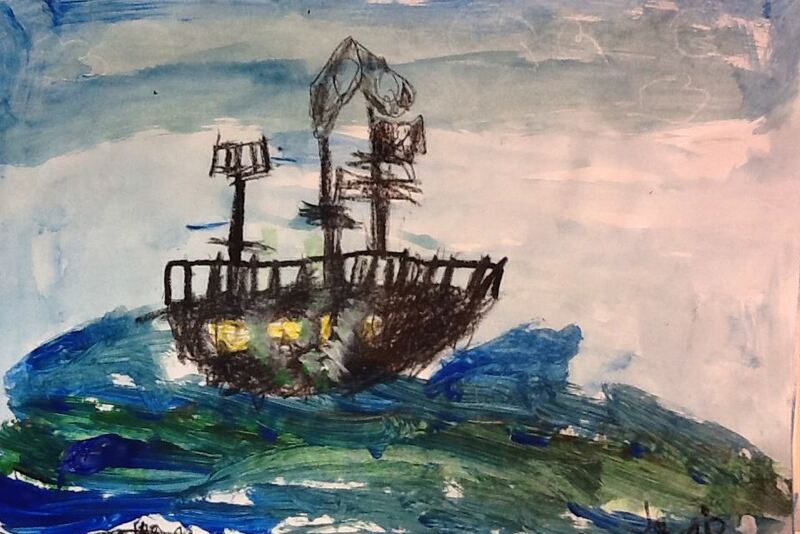 The Getty recently had a JMW Turner exhibition with all his amazing images of ships. 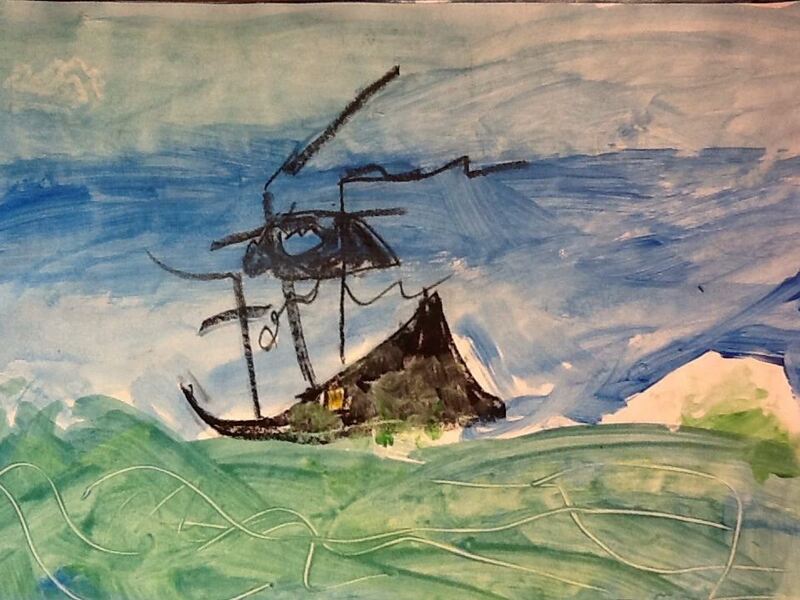 This lesson was inspired by Turner and our upcoming trip to the Timken Museum in Balboa Park. Students looked at a few ship paintings from the Timken Collection which included American Ship in Distress by Thomas Birch and A Seaport at Sunset by Claude-Joseph Vernet. 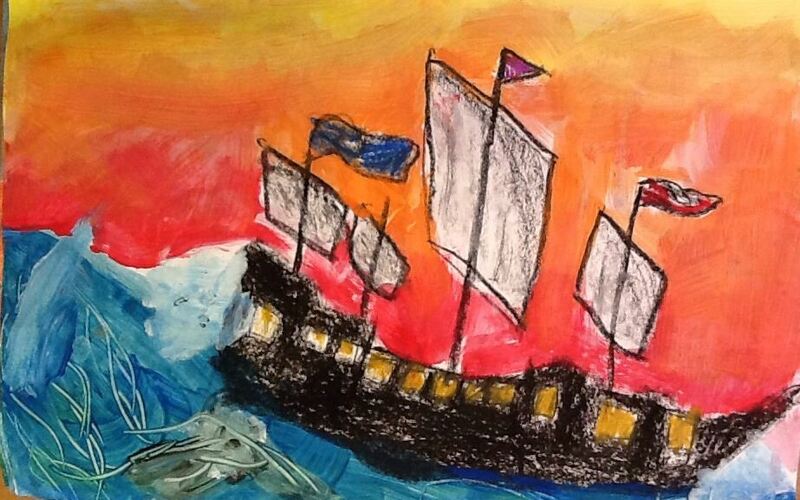 These images were created in oil pastel and tempera. 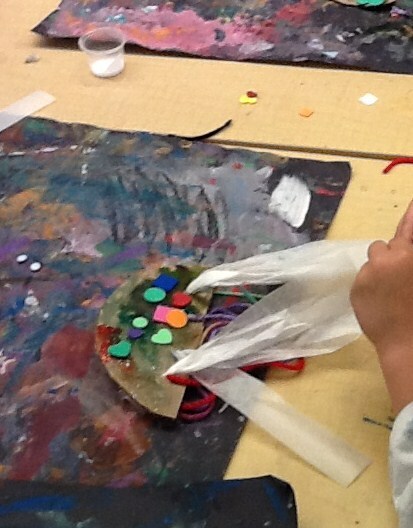 Fourth graders started with a blob of homemade playdough on a small square of brown paper bag. 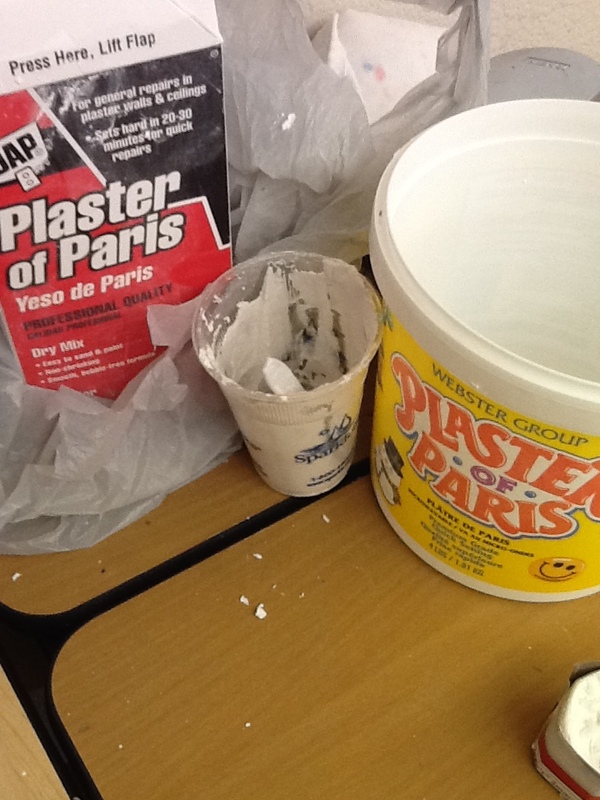 I tinted it to be able to see the difference between the plaster and the playdough. 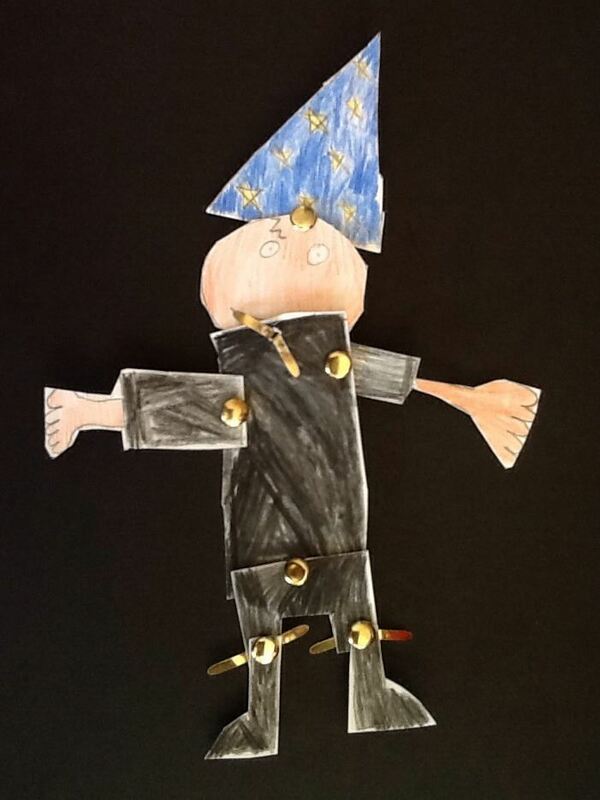 The student flattened their blob to make a coin shape. 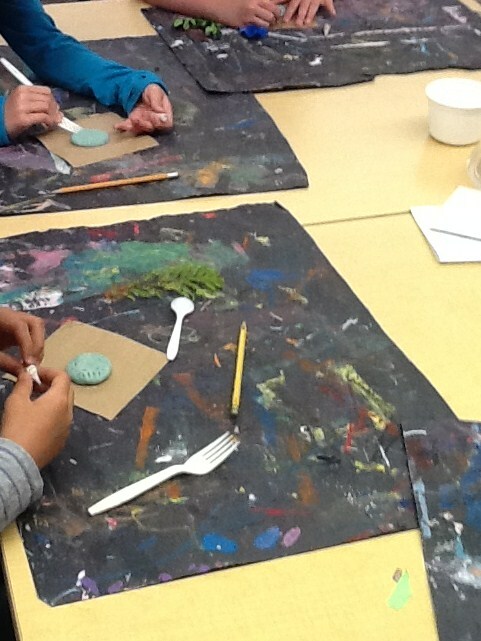 Modeling clay and purchased playdough can also be used. 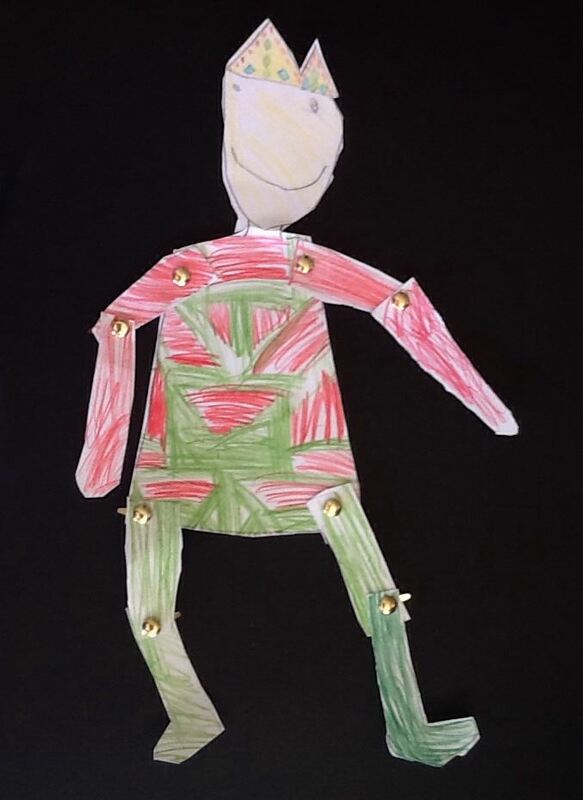 One student is allergic to playdough so that child used modeling clay. 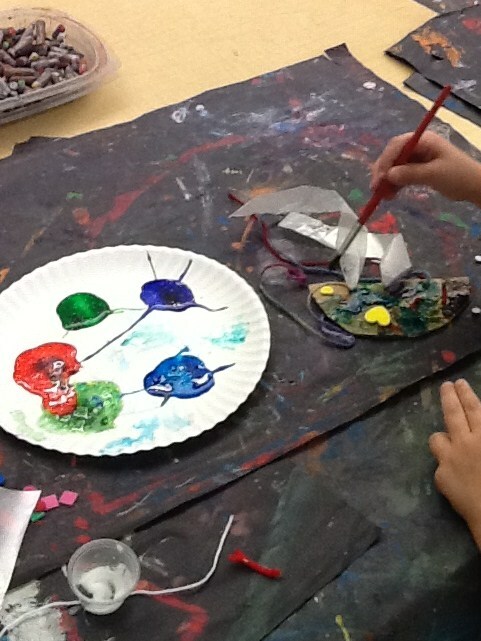 They pressed various items into it to make an impression. 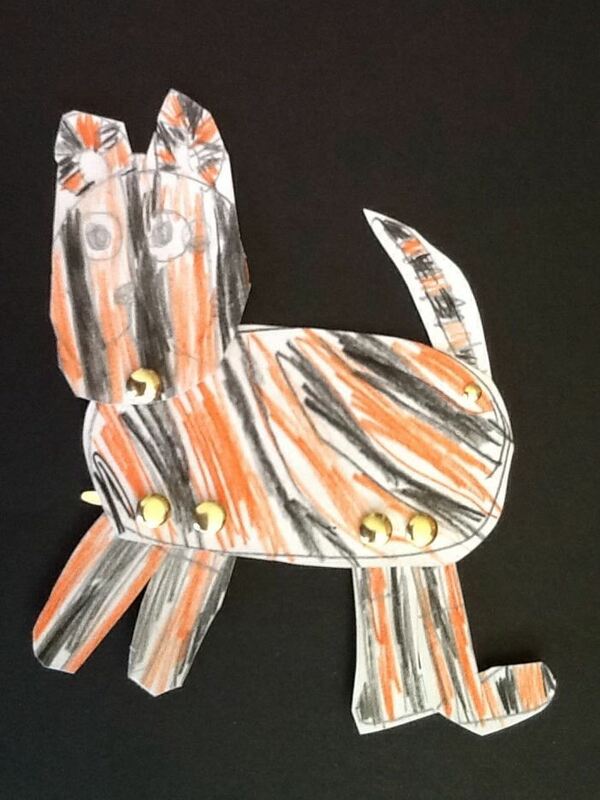 Baskets, forks, blocks, shells and other objects to give it texture. Once complete, they dusted the dough with a thin layer of cornstarch. They then created a dam with cereal cardboard. 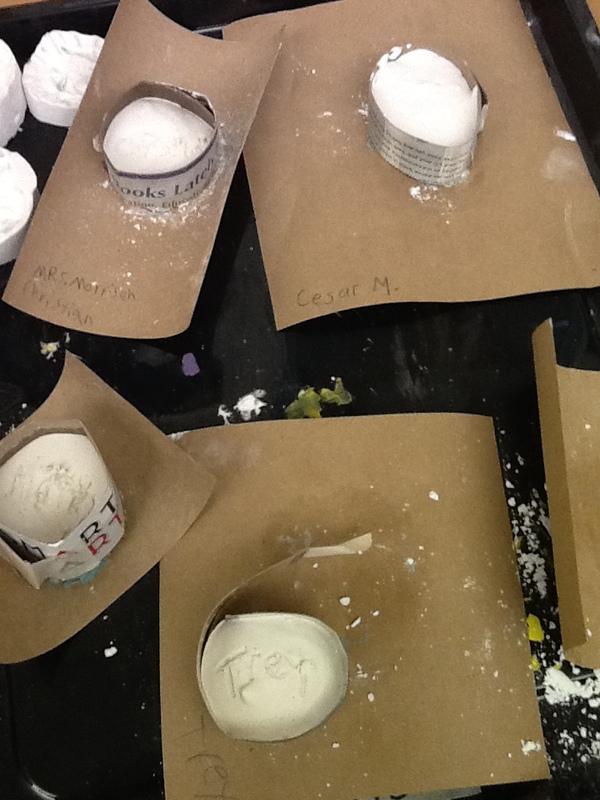 Teachers mixed and poured plaster of paris into the mold. 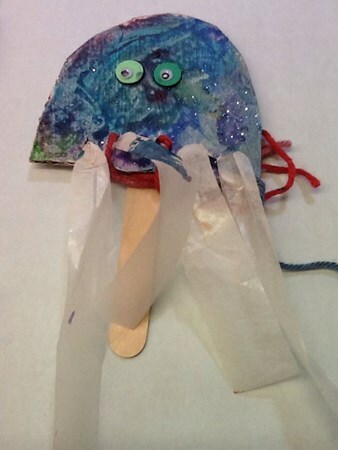 Once dry, the cardboard and playdough was removed. 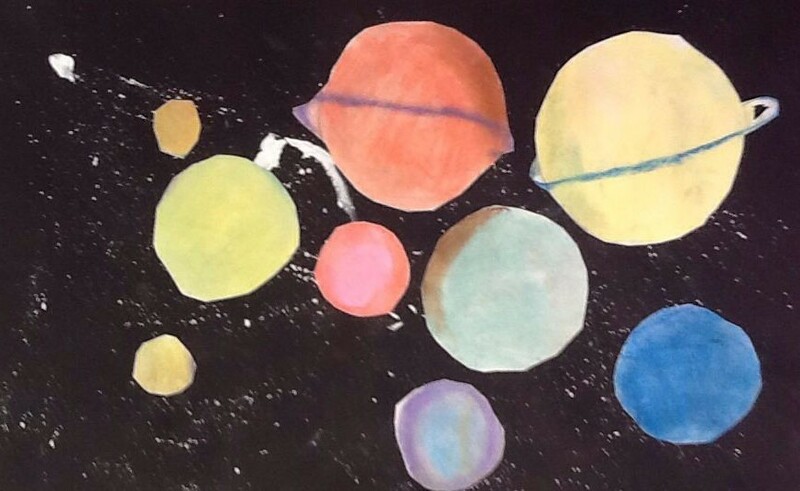 Students will paint the disks next class period. 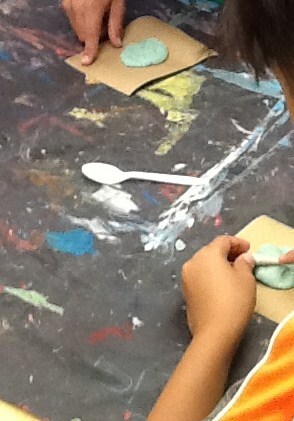 Some of the playdough that stuck was removed with a plastic fork and/or a stiff brush. 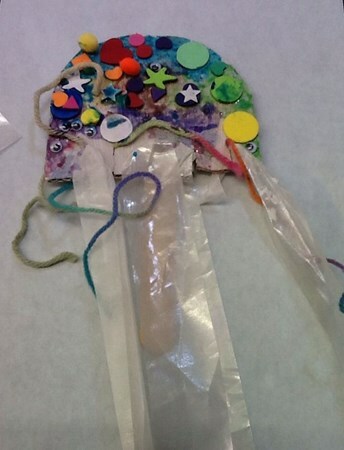 I have seen several different mixed media jelly fish. 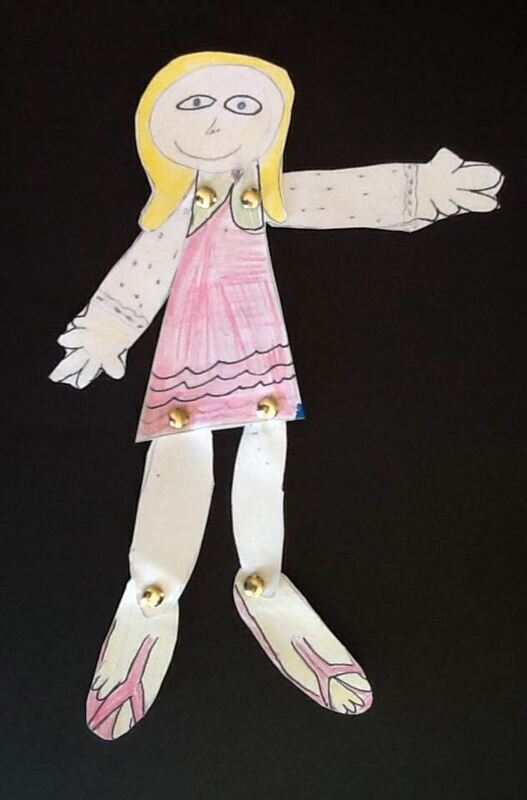 This is my version created for the PM4 Preschool class. 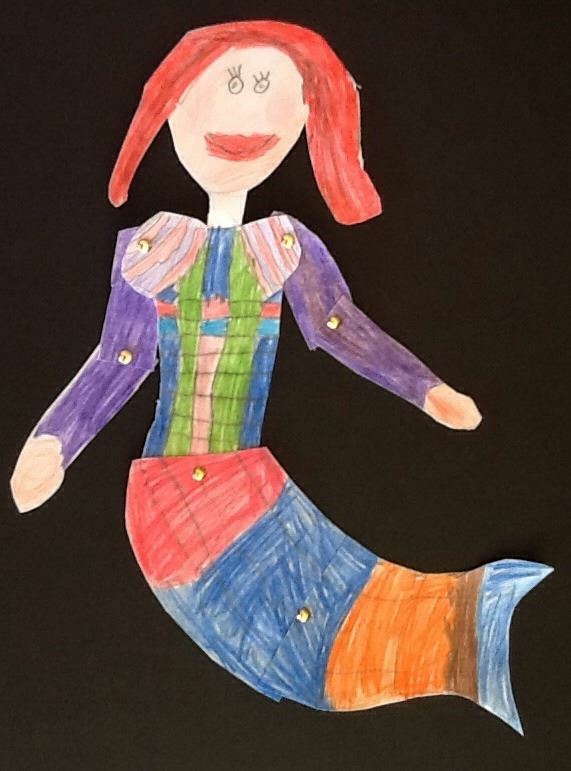 They are a very capable group with excellent art skills. 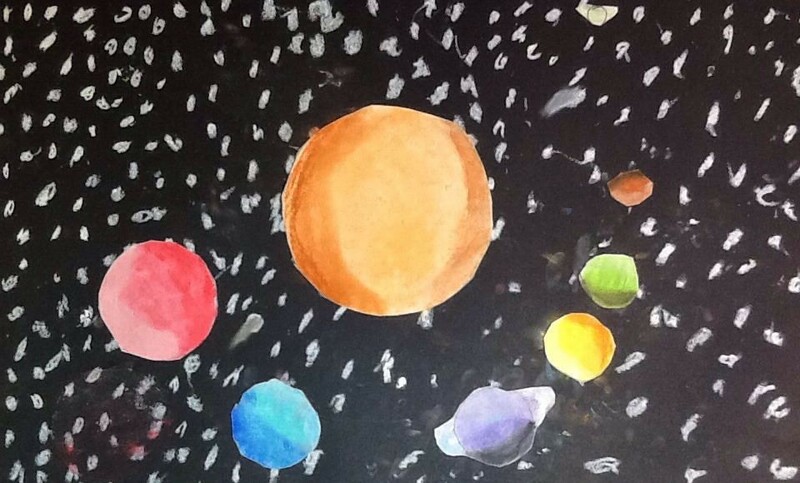 I was gifted a large amount of cardboard scrap so I cut it into half circles and gave it a swab of white tempera. I also have a roll of this cool looking iridescent paper that is from some business machine that was gifted to me as well. I cut that into strips. I also cut up pieces of yarn for the students. 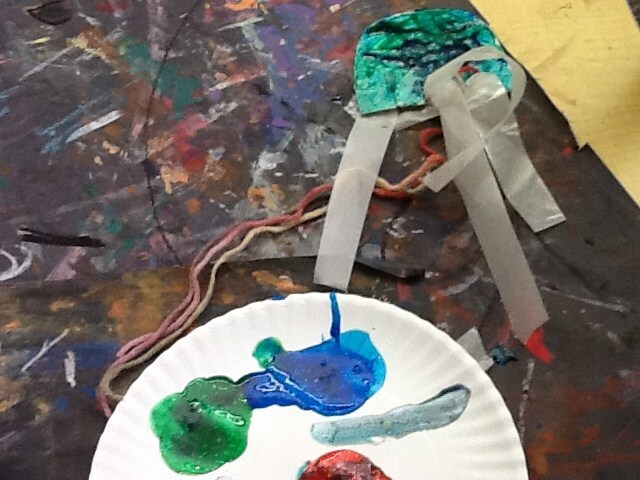 When students arrived, they used the string and the paper to add tentacles to bottom of the half circles. I have already cut a few slits in the bottom so they could push the yarn or paper into the slots. I told them it was like flossing teeth. 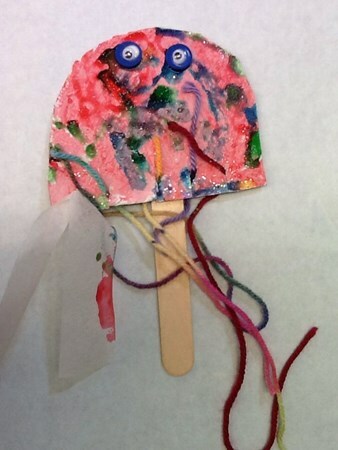 They then painted the half circles with glitter paint (another donation) and added foam shapes and googly eyes. 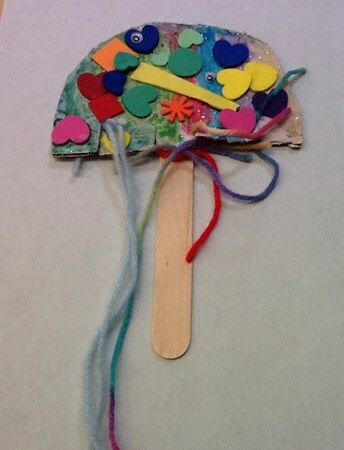 Once dry, I added a craft stick so they can use them as puppets.